What else screams “fall is here” like the annual Oklahoma Corn Maize? It literally screams it! Every year, Reding Farm is home to the largest corn maze in the state of Oklahoma, located in Chickasha. However, this is not a typical roam-through-the-corn type of corn maze. They have hayrides, a mini cow train, and, for those who love to be spooked, they have a haunted hayride and haunted corn maze option! This fall experience does not end at the hayride and corn maze. After getting lost in the mazes, there is a bonfire where people can warm up. There is also a pumpkin patch, a corn cannon, a sandbox and many farm animals to see. After seeing Reding Farm, people can pay a visit the concession stand for some food, s’mores kits and hot chocolate! It is ten dollars for the regular hayride and corn mazes. For the haunted hayride, it is an additional ten dollars, and for the haunted maze, it is an additional fifteen dollars. However, they have package deals that give you access to a variety of activities. Package A is fifteen dollars and includes all activities with unlimited rides, except for the haunted options. Package B is twenty dollars and includes all the haunted activities. Package C is thirty-two dollars and gives you access to the entire farm and activities. Every year they have a theme that they literally depict in the cropping of the corn. This year’s theme is in correlation with the Oklahoma City Zoo’s 30th year of Haunt the Zoo, which is a trick or treating night at the Zoo. The corn has been shaped to pay tribute to this and some of the animals you can find at the zoo. These animals make up the different mazes with each having a different level of difficulty. 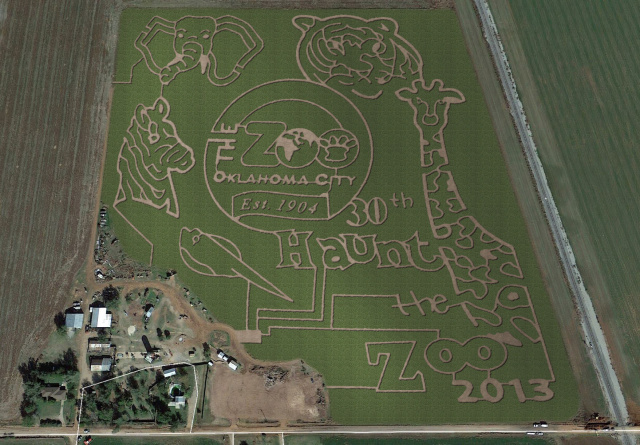 On October 19 and 26, the Oklahoma City Zoo will be bringing the animals to Reding Farm to add to this year’s corn maize experience. If you are not quite feeling like it is fall yet, this is the perfect place to get you into the boots and scarves season!